Just about any serious mobile application will have two or more “pages.” (We’re going to refer to pages throughout this series, though that is less meaningful in mobile apps than it is in, for example, desktop applications). The starting point for Xamarin.Forms navigation is with the Navigation service. To see how this works, let’s create a new Xamarin.Forms (blank) application named NavigationDemo. We need to wrap the main page in a NavigationPage instance to set up the navigation system. Navigating from one page to another will be accomplished using this service. 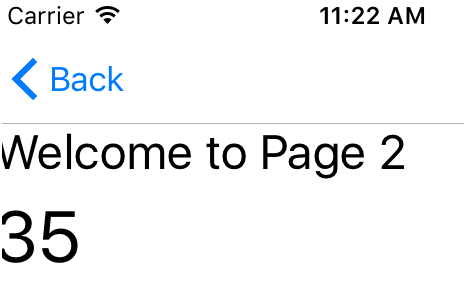 To see this at work, let’s create a second page which we’ll name Page2.xaml. In the dialog box, select Forms on the left, and Forms ContentPage XAML on the right. Name the page Page2 and click New. All the action will happen in the Button’s clicked event handler, which is in the code behind page. Notice that we use the PushAsync static method of the Navigation object. That invokes the navigation service so that when you click on the button you are taken to Page2. Go ahead and try it, I’ll wait here. Note that the “Back” button on Page 2 is provided for you automatically by the Navigation system. Often, you will want to pass data from the calling page (in this case, NavigationDemoPage) to the called page (in this case, Page 2). Notice that we set the BindingContext to “this” — that is to Page2 itself, which is where the property we’re binding to (TheValue) is located. The result is that when you navigate to Page2 you see the value that was passed from NavigationDemoPage. Unhandled Exception And Another One error showing from App.Xaml.Cs Page.